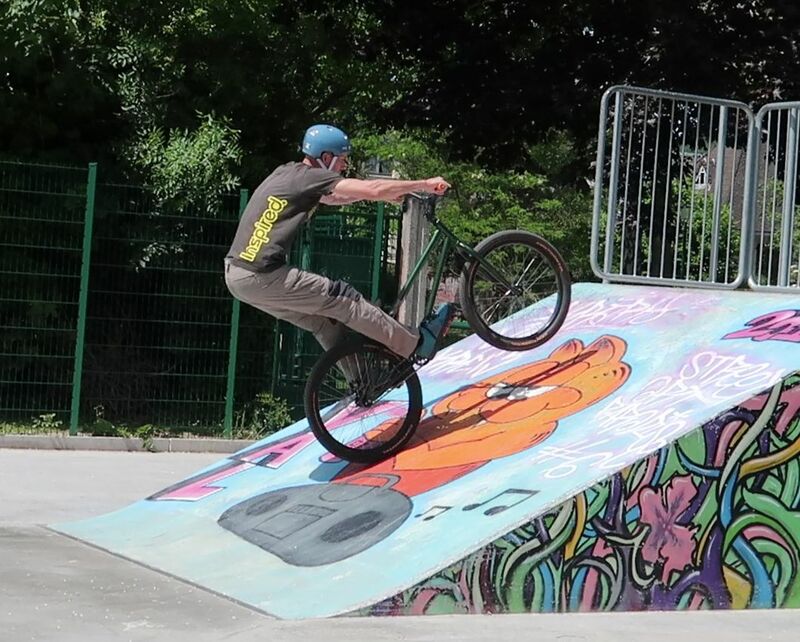 The fakie nose manual consists in riding backwards, in balance over the front wheel. Because you can't pedal to maintain your backward momentum, it'll work better down a slope, controlling your pace with the front brake. Control your balance with yours hips close to the stem. 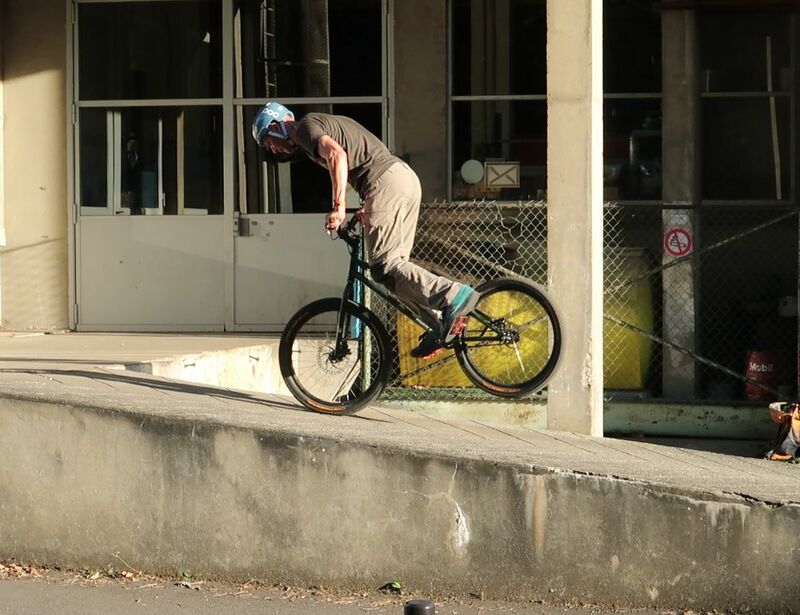 Although the fakie nose manual is a natural extension of G-turns, it'll be easier to learn separately down a mild slope. 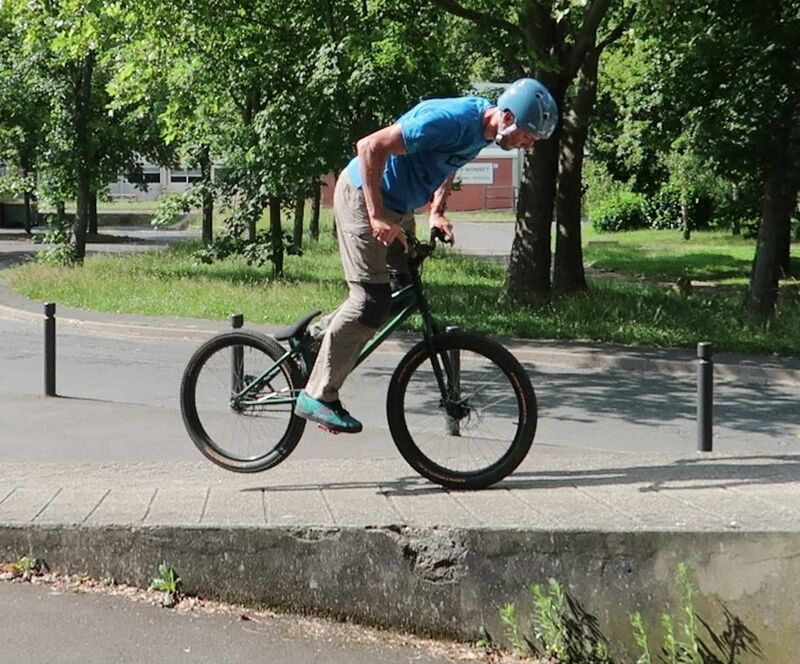 Then you'll be able to focus on the "nose switch" first, that is, the moment you switch from pedalling backwards to lifting the rear wheel up and balancing over your front wheel in motion. You can start from a trackstand position against the slope and then backpedal one full crank turn to let the bike roll backwards, building momentum. Or alternatively, if you find this cold start a bit difficult, launch a small endo and push yourself back on the front wheel to initiate the movement backwards, backpedalling to let the bike gain momentum. pedal is at the lowest. Leaning forward, backpedal for no more than one full crank turn. As soon as your front foot has swung back to the front but while it is still in a low position, surge forward, tilting your torso over the front wheel while pointing your feet down and applying pedal back-force to lift the rear wheel up (like when you level up the bike in a bunny hop). Don't be afraid to overdo it, else the rear wheel won't take off. Note that as you backpedal, you'll tend to be leaning forward. 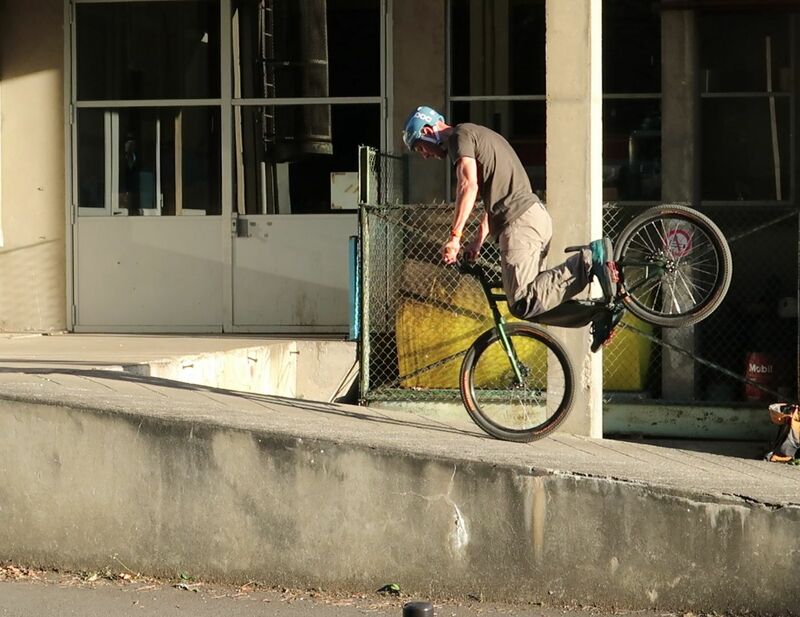 Don't be shy swinging your shoulders well over the bars but try to keep your arms as straight as possible, pushing down on the front wheel to make it roll back underneath you until you reach a point of balance over it. The rear wheel will lift up more easily if you synchronize the surge of your shoulders forward with pedal back-force applied right before your front pedal moves up again (when your front foot has come back to its lowest position, you'll have more grip and more vertical push on that pedal to lift the rear). 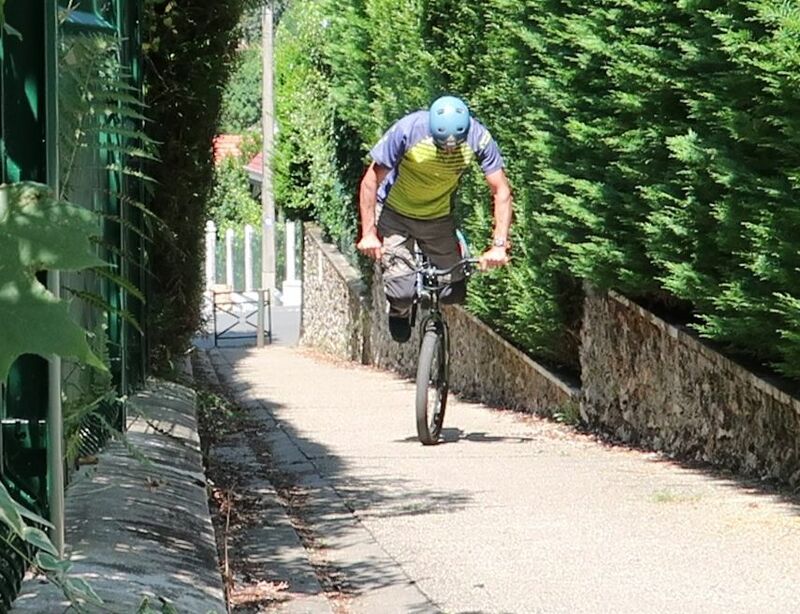 As soon as the rear wheel is up in the air and you've reached the balance point (your waist pretty much over the front hub) feather the front brake to control the pace at which the front wheel "sinks" beneath you, down the slope. 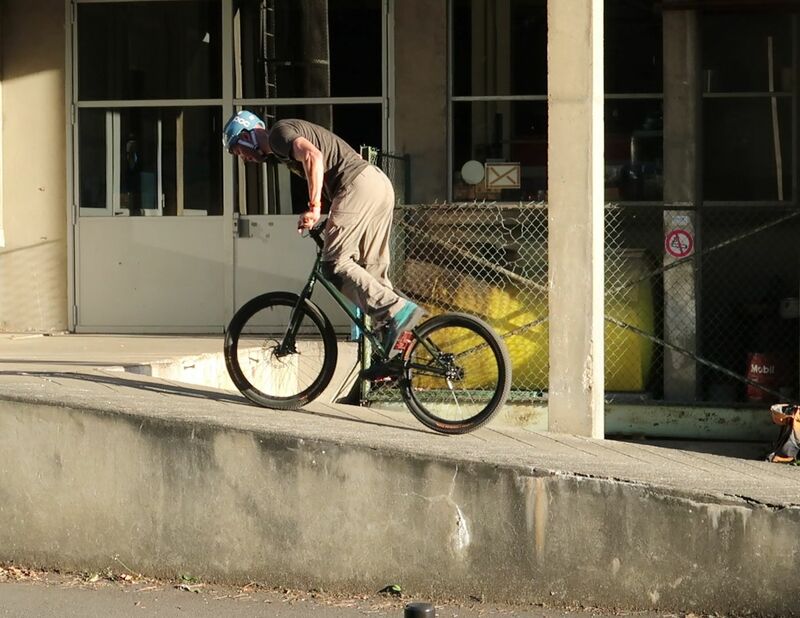 It is a strange sensation at first, but hold on to the bars and try to lock your arms straight, only to adjust your balance with subtle moves of your hips relative to the handlebars (flexing the knees to get closer to the stem). 1° From a trackstand position against the slope, backpedal to let the bike roll backwards. 2° When your front foot has swung back at a low position, surge forward, pointing your feet down. 3° Lean well over the handlebars, shoulders over the front hub, apply back-force on the pedals. 4° Scoop up the pedals with your feet to lift the rear wheel up and switch to front wheel. 5° Keep your arms as straight as possible, flexing the knees and pushing down on the front wheel to make it roll back underneath you. 6° Once you get rolling, adjust your balance with subtle moves of your hips relative to the handlebars, feather the front brake. On long stretches, correct your lateral balance with turns. It'll be easier to control your balance if you lean frankly forward, eventually using the front brake to refocus yourself over the front wheel when it "sinks" too far down the slope. Focus on starting straight, otherwise, the frame will swing sideways to the ground. 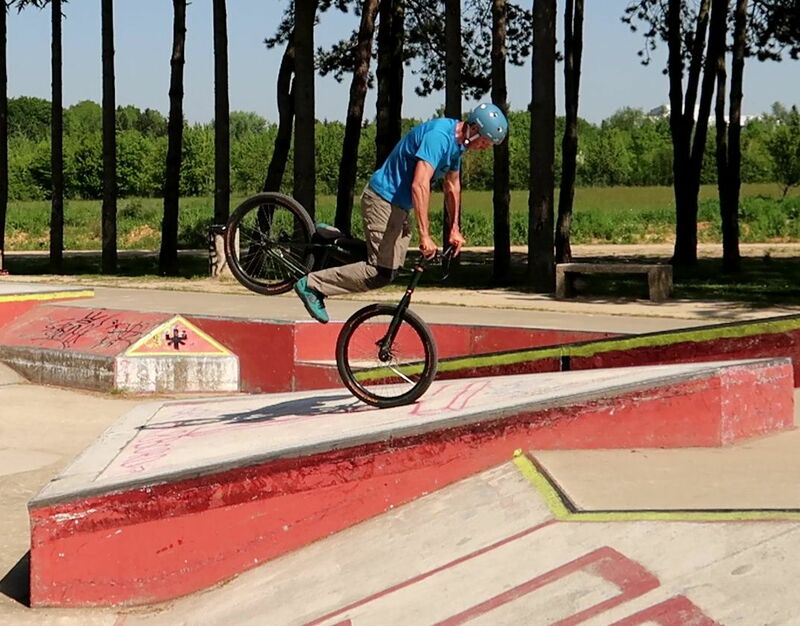 Once you've progressed beyond the initial nose switch and when you can ride a few yards, focus on a straight start and correct your lateral balance when you feel that the frame is swinging sideways. If the bike falls to your left, then turn the bars slightly to the right, this will bring the front wheel back underneath your centre of gravity. Turn to the left if you feel you are losing your balance to your right side. 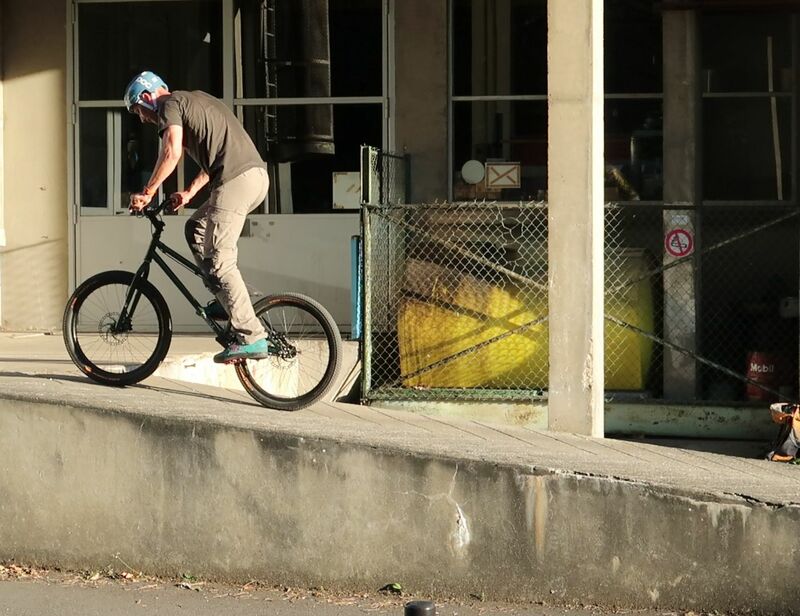 A small endo up a quarter pipe will take you into a brisk fakie nose-manual. Failure scenarios are quite mild. If you fail to control your front brake, you'll naturally tend to take your back foot off the pedal and step down to stop the move. 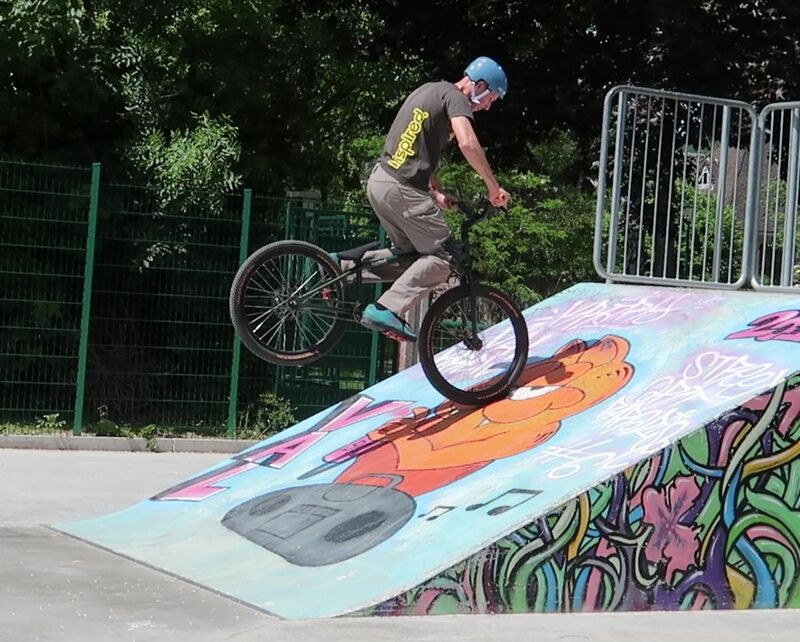 Always feather the front brake, then if you feel you are about to crash over the bars, you'll be able to lock the front wheel faster to step down in a graceful manner (i.e. not a face-plant). 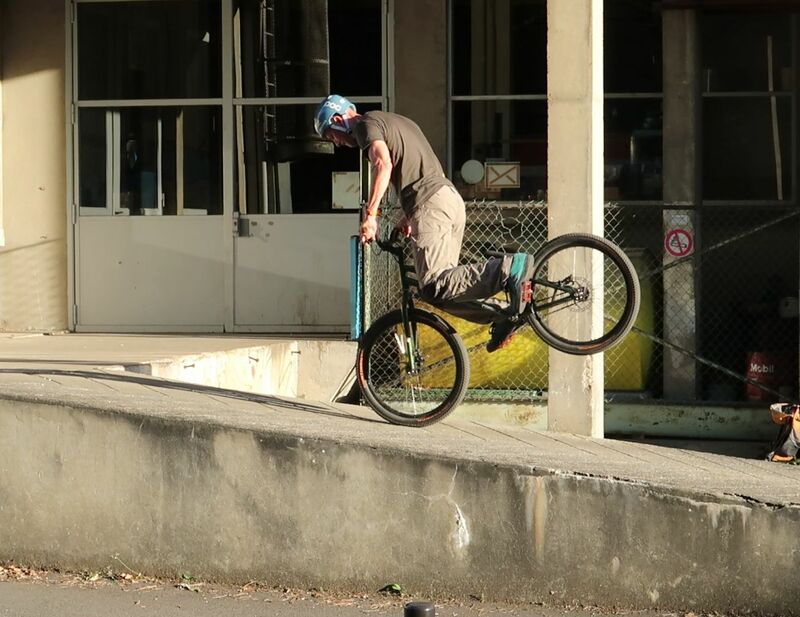 Since you'll have to launch the fakie nose-manual at the top of a sloped obstacle, a neat transition is to ride it up as far as you can holding a manual and hop directly to front wheel to ride down into a fakie nose-manual, without messing with the pedals. 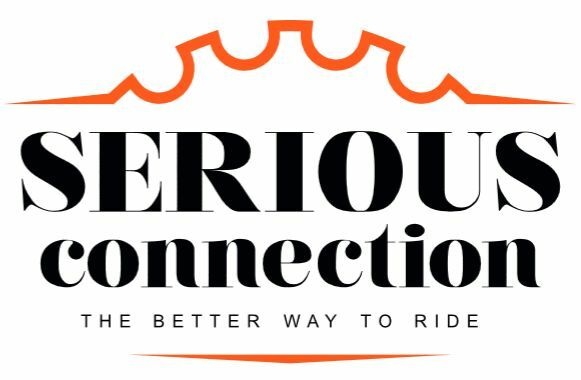 1° Cruise at a good speed and ride up a slope or a ramp holding a manual until the bike stops. 2° When the bike is about to stop naturally, surge forward to lean over the stem. 3° Use your inertia to whip the bike down underneath you and tilt it directly onto its front wheel. 4° At the same time, tuck your knees and apply pedal back-force to scoop up the rear wheel and roll the front wheel down. 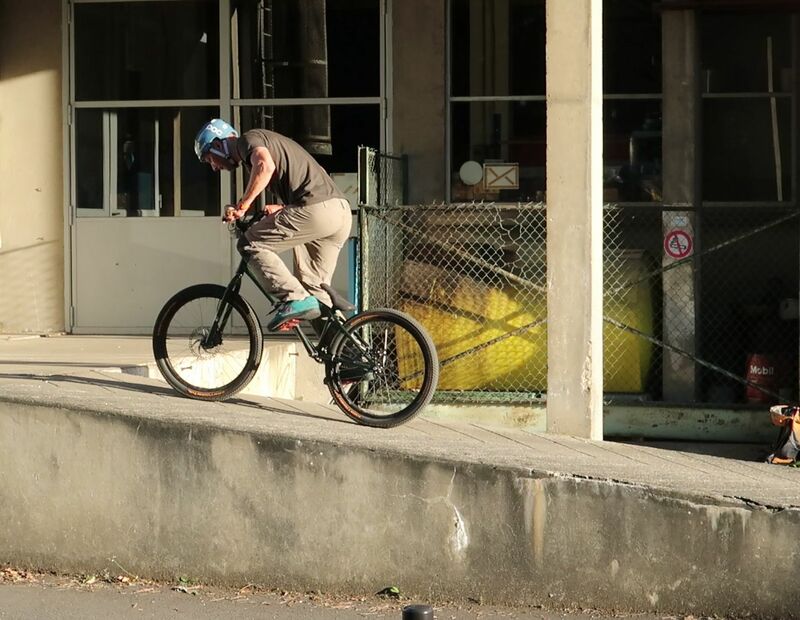 Once you've learned to fakie nose manual down a slope, you can try to launch it on the flat or use it as a transition over an obstacle. Either start with an endo to ride backwards, or cruise at a comfortable speed and perform a quick 180° endo to turn your momentum into backward motion. 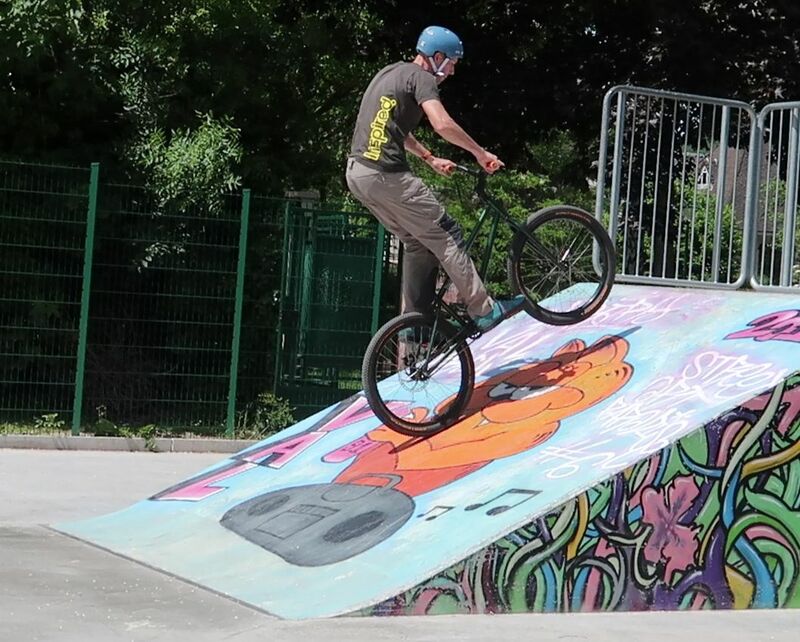 Once you feel comfortable with the fakie nose manual, you can tackle the G-turn.